If you hear the word “vocab,” what do you think of? Personally, I remember hours of memorizing words on flashcards. Or spelling tests in middle school. Or Spanish class, when I desperately tried to make up songs to remember the differences between conducir, encontrar, and comprar. Or snooty people at dinner parties with bigger vocabularies than mine. 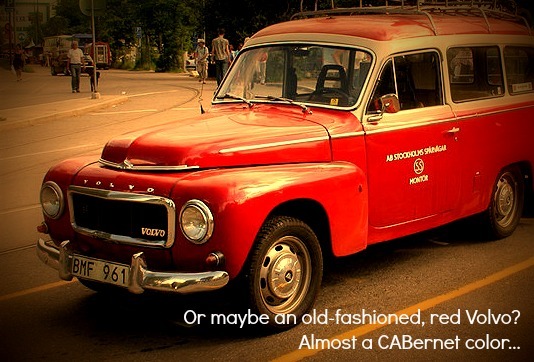 Or, I could start to break it down a little more abstractly and think “Vo Cab”…which could maybe be a Volvo cab. A Volvo taxi, high-class and fancy, that can take me anywhere I want to go—just like a well-developed vocabulary. If you want to get a good score on the SAT Reading section, you have to have to have to know your vocab. But while you might associate pain or frustration with memorizing vocab…you can actually use that to help you. Let me explain—and I promise it’ll be painless. 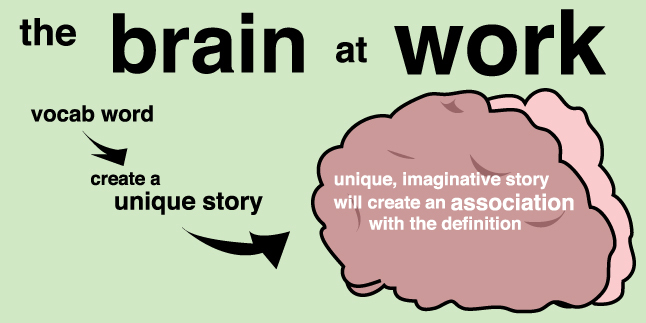 This is how your brain works. So that whole introduction wasn’t just me slipping off into wandery nostalgia. I was actually sneakily demonstrating association. Your brain loves to make connections between things. That’s why when you’re sad, and it’s raining, there’s a little part of you that feels like maybe your sadness is so heart-wrenchingly profound that you actually altered the weather. Or why you can see a leaf fall from a tree and suddenly get crystal-clear, long-forgotten flashbacks to your first day raking leaves, or visiting the mountains, or watching an episode of Doctor Who. This is how it helps you. The good news is you can harness the associative power that your brain was built for, and use it for practical things like acing your SATs. You’ll memorize SAT vocab in a snap! The better news is it’s actually kinda fun. The trick is creating a crazy story that will remind you of your vocab word. And the more complex the story is, the better the chances that you’ll remember your word—not just for the SATs, but for the rest of your life. 1) Think of a tangible object you can link with your word. Abduct? Think abs in an air duct. Effervescent? Effie from the Hunger Games. 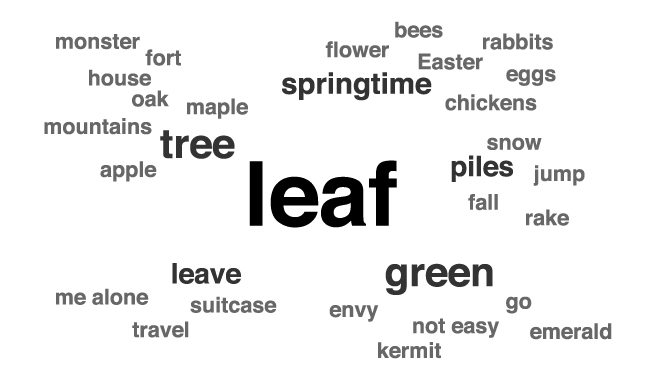 What words or images does your brain spit out in response to your new vocab word? Pay attention to them and find a good starting spot for your story. Take your tangible object and make it big and memorable. Suddenly it’s not just abs in an air duct—they’re abs belonging to a body builder, crawling through the longest air duct in the world. Take something ordinary from your tangible object and swap it out for something else. For example: instead of a cold, shiny metal air duct, there’s actually bright neon fur lining the entire thing. Here’s the fun part, where you get to let your brain roam free. Think of a wild way to end it! And remember, this is all for your memory. It’s 100% private. So nothing is too stupid. Our example here will be the body-builder’s abs in a furry air duct that happens to be the longest furry air duct in the world—and maybe it turns out to be the esophagus of a giant furry monster! Or maybe a long tube into an alien spacecraft! Maybe he’s being sucked up the furry tube and can’t fight it, even if he tried! The aliens are abducting the body-builder! I took the word “abduct,” wrote down a quick association (“abs in an air duct”), and then created a story that reinforced the definition. And as the story got crazier, the more tendrils my brain grabbed onto, until I associated this poor defenseless bodybuilder with being kidnapped and taken by force—abducted. Aesthetic sounds a lot like anesthetic, doesn’t it? And they put people under to give them plastic surgery? That’s definitely one way to think about the appreciation of beauty. Or contempt? Think about how you would feel if a con man tempted you into playing that street game where they have the three cups and the pebbles and you try to guess where the pebble is—and then suddenly you didn’t have any money left! You’d feel a lot of contempt for that guy. Now you try. You can even expand on these opening examples—just remember to exaggerate, substitute, and imagine. And soon, your vocab will be bigger than the snootiest dinner-party person, and you’ll be able to put them in their place. And also, you’ll totally knock your SATs out of the park. Think of a tangible object to link with your word. Substitute it–switch out one element of your story with something else! Imagine it–come up with a crazy, creative ending! If you follow these steps, you’ll learn your vocab in no time. What were your toughest vocab words? How did you memorize them? Do you have any fun stories? Let us know in the comments!